Long time, no letter. There is a package here for you and since it was large and light of weight and not very securily wrapped I looked in to see if I should send it on – it is a picknic basket. Do you want it sent on? If you do I will send it. John has gone to Urbana today on business. He had to make a trip over last Thursday. We had planned to go to Chicago. Dad got the baby-case out of the way (he has a little time now until the next one scheduled) so we (Dad and I) went and stopped at Aunt Ruth’s. Romaine and her children were there (Tye had to make a trip to Chicago on business, so we missed seeing him). We had a nice visit with them, then went on to Mark’s. Becky came home with us and Friday evening Mark and Shirley stopped for her as they were going to Wards. She seemed to have a very nice time and yesterday when they stopped on their way back home she didn’t want to go with them, but wanted to say here. It has been very hot here – in fact I think we have set some kind of record again. You know the Midwest is always having some kind of first in weather. Mr. Harris told me this morning that every window fan and air conditioner they have has been sold. I think from the way he talked every dealer has sold out. I talked to Mrs. Myers one day last week and she was having a bad time with the heat. She said it was the first time it had bothered her. She told me she had tried to buy a window fan and couldn’t get one. The weather forecast is for cooler this evening. I hope so for all the people who do not have air conditioners. We are going to give a program for the Nurse Association at the Hospital tonight and I think it will be a rather warm evening. The air conditioner at our office wasn’t functioning properly and the repair man from Sears was working on it this morning. Dad told me at noon if he didn’t get it fixed he was going to cancel out the afternoon appointments. He hasn’t come home, so I presume it has been put in order. I decided to buy myself the Interpreter’s Bible and Dictionary. The dictionary came today, but I haven’t had time to look it over. I brought back 23 Genesis study books and have distributed all but two. I am in a dilemma. I still have 3 families. I just didn’t bring enough copies back with me. However, I know some of those books will not be opened. – Yesterday afternoon Dad had a telephone call from one of his Commanding Officers (in South Pacific). He was stopping at Tri-Way so Dad asked him to stop and see us. He told us how much he thought of Dad and what a morale booster he had been during the war. Mark and Shirley and children came just as he was leaving so he got a chance to see them. Of course John was here too, so he got to see all of us but you and Bonnie. Please excuse lack of paragraphs, but I got so used to writing this way to John, I hope you don’t mind. Last week (Sat. to be exact) John helped me and we sent out the statements. Isn’t such a bad job when there is some help. He even used my old typewriter. He has his work spread out all over your room. He is doing some work on Indonesian language (I think). His work at U of I will be in Linguistics and with graduate students. He may try to find something in housing on this trip. At present he will be staying at Bob & Lea’s. He asked me if I knew what Bob taught. I replied, “Business English.” He said, “He teaches people how to write junk mail.” I suppose it needs to be well written because once in a while someone will read it. My afternoon is getting away from me, so must bring this to a halt. I want to stop and see Mrs. M. before I go to the office. 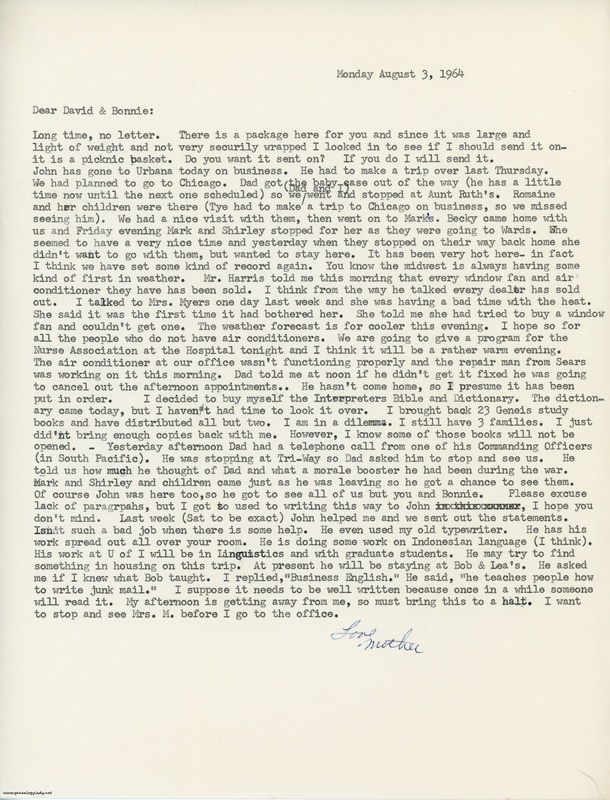 This entry was posted in Genealogy, Yegerlehner and tagged 1960s, Boston, David A. Yegerlehner, genealogy, Gladys R. (Foster) Yegerlehner, Indiana, John Earl Mutchler, John F. Yegerlehner, Kentland, Kirk Yegerlehner, Lena "Lea" (Keith) Gieselman, Mark A. Yegerlehner, Massachusetts, Rebecca C. Yegerlehner, Robert Gieselman, Roscoe S. Yegerlehner, Ruth E. (Yegerlehner) Mutchler, Ruth M. Myers, Ruth Romaine (Mutchler) Glass, Shirley (Ward) Yegerlehner, Tye Glass on January 5, 2017 by Deborah Sweeney. I think that John was right that Bob taught Business English, but to call it “teaching people how to write junk mail” was not really fair. There are courses today in Business French, Business German, etc. because there are specialized vocabularies that must be learned. “Mr. Harris told me this morning that every window fan and air conditioner they have has been sold.” I may be wrong, but I think he was the manager of the Sears store. “Yesterday afternoon Dad had a telephone call from one of his Commanding Officers (in South Pacific).” At that point a mere 20 years in the past. “He asked me if I knew what Bob taught. I replied, “Business English.” He said, “He teaches people how to write junk mail.” ” THAT is hysterical! I remember John saying this. 🙂 John’s biting sense of humor….but not really fair. So what did Bob do?